Fall is on the horizon and what better way to celebrate the fall season with an all natural pumpkin facial scrub? Organic food on your skin can be the best beauty treatment and it's usally cheaper then buying those expensive scrubs that don't deliver the same results. The benefits of exfoliation include: Detoxification of the skin, brightenning skin, eliminate dead, dull skin cells to reveal healthy, younger skin, helps reduce fine lines and sun damage, improves skin tone, kills bacteria and prevents breakouts and improves product penetration and treatment results. And who doesn't want that? Here's an easy to make and yummy facial scrub recipe from spa manager, Michelle Pino, at Skana Spa. Rinse face with luke warm water and pat dry prior to using the face scrub. mix ingredients together and apply to face. Gently scrub! Many people make the mistake of scrubbing vigorously, which can irritate the skin. 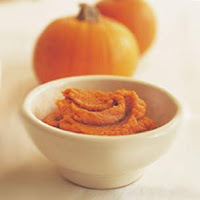 Pumpkin: High in Vitamin A (skin healing), C (anti-oxidant) and Zinc, pumpkin soothes, moisturizes the skin. Brown sugar: The moisture in brown sugar won't dry out your skin as you exfoliate. Brown sugar is a source of B vitamins due to its molasses content. Honey: the consistency of the honey is what helps old the scrub ingredients together. It targets breakouts, reduces redness and calms inflammation. Try this natural fall scrub, search for do it yourself, all natural facial scrubs or make your own. Be sure to leave me a comment with your favorite homemade scrub. Either way just have fun with it and enjoy the season. Wow man we can use pumpkin as facial scrub, thanks for sharing the post for pumpkin natural face scrub.